Reserve Bank of India is going to recruit fresher candidates in India for Office Attendant Posts. So, those candidates who are willing to work with this organization they May apply for this post. Last Date of Apply 07-December-2017. Total numbers of vacancies are 526 Posts. Only those candidates are eligible who have passed 10th Standard (S.S.C./Matriculation) from the concerned State/UT and candidate should be a domicile of the State/UT coming under the Regional Jurisdiction of the Recruitment Office to which he/she is applying. 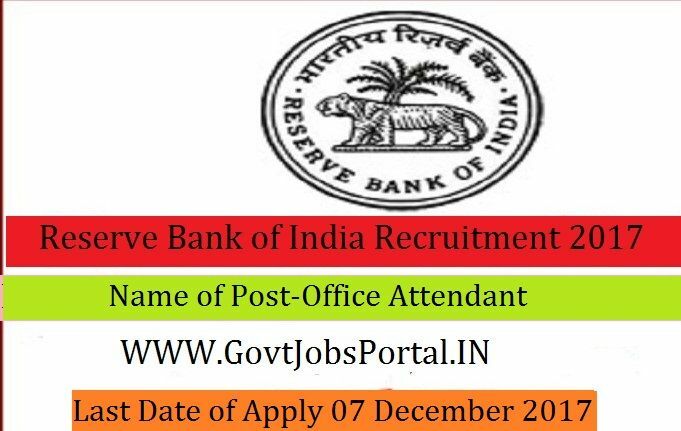 Indian citizen having age in between 18 to 25 years can apply for this Reserve Bank of India Recruitment 2017. Educational Criteria: Only those candidates are eligible who have passed 10th Standard (S.S.C./Matriculation) from the concerned State/UT and candidate should be a domicile of the State/UT coming under the Regional Jurisdiction of the Recruitment Office to which he/she is applying.